Surging revenue and profits have helped make the social media giant one of the market's biggest stocks. What: Social media titan Facebook's (NASDAQ:FB) stock is up 9% so far in 2016, according to data provided by S&P Global Market Intelligence, and is outperforming the broader market by 8 percentage points. This year's rally adds to impressive gains for long-term shareholders, who are up 33% in the last full year and 200% since 2013. Facebook is now worth well over $300 billion, for the eighth-largest market capitalization on the S&P 500. So what: CEO Mark Zuckerberg and his executive team have given investors many reasons to be bullish on the stock this year, beginning in late January when Facebook revealed a 57% fourth-quarter sales spike as its daily user base crossed 1 billion. Profitability soared to 44% of sales from 29% as the company's average revenue per user increased in every region of the world. Its second quarterly report of the year provided more of the same. Revenue grew by 52% and net income tripled to $1.5 billion. 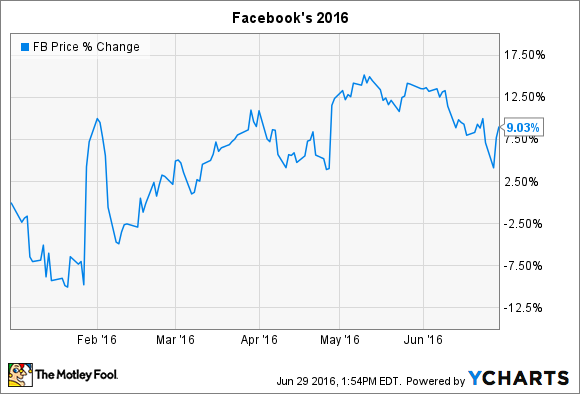 Facebook's monthly user growth trounced rival social media networks. Monthly users rose 15% in Q1, compared to just a 3% uptick for Twitter (NYSE:TWTR). 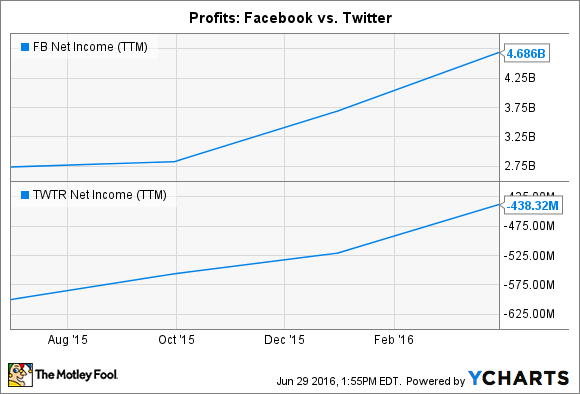 FB Net Income (TTM) data by YCharts. At the same time, while it's clear that Facebook has figured out how to monetize its customer base, Twitter hasn't. The news-heavy social network has lost $400 million over the last 12 months as Facebook's profit pace has improved from $3 billion to nearly $5 billion. Now what: In April, Zuckerberg outlined a few key growth areas that executives see as critical to boosting the user base beyond the 1.1 billion people who, on average, use Facebook for nearly an hour each day. These initiatives include video upgrades like the new live broadcasting function and 360-degree interactive content. The company also sees a bright future ahead for messaging, artificial intelligence, and virtual reality. A new structure to Facebook's shares keeps Zuckerberg firmly in the driver's seat while those initiatives develop. What that means for shareholders is that the company is likely to continue making big bets that may or may not have any obvious payoff. "When I look out at the future," the CEO told investors in April, "I see more bold moves ahead of us than behind us."